SPACEPORT NEWS June 23, 2006 Page 2 Awards The Kennedy Update Jim Kennedy Center Director G reeting, friends! We are about a week from launching mission STS-121 and I am thrilled. The prime crew was at Kennedy Space Center last week for the Terminal Countdown Demonstration Test and the excitement of the astronauts was contagious. Commander Steve Lindsey repeatedly expressed his confidence in the launch team and I echo his feelings. Im sure you all join me in wishing Steve and his crew good luck and a safe mission. I also join Mike Griffin and all the members of the Mission Management Team and thank you for your tremendous efforts in getting the payload, Discovery and the other shuttle components ready for this flight. It has been a long haul to get us to this launch window. Even as we held the Flight Readiness Review for STS-121 at KSC last weekend, others continued work on the other vehicle waiting in the wings to fly. So if all goes well with Discovery in July, and Im very confident it will, Atlantis will fly in late August or early September. Its great being in the human launch business again. As you may have read in the news lately, KSC has been actively rounding up roadkill. Our KSC posse has been working with the good people at the U.S. Fish and Wildlife Service to raise awareness and minimize the number of birds near the shuttle launch pads. A buzzard struck Discoverys external tank during the first seconds of launch last year and, though a rare occurrence, we dont want to unnecessarily put the vehicle and crew at risk. As work resumes on the International Space Station, Kennedy Space Centers work assignments for the Constellation Program have come clearly into focus. The first phase of this work will be to provide project management for the transition of the ground facilities and systems from the current human space flight mission to the next-generation space vehicle. Specifically, KSC will design, develop, test and evaluate the facilities and systems for ground processing, launch and recovery of the new space vehicles. And it is exciting to be planning for the launch of the first test article from KSC as early as 2009. I want to thank the members of our weather forecasting team. They were tireless in keeping us all informed about Tropical Storm Alberto and its brush along Floridas west coast last week. Although damage was minimal, the storm provided a reminder that if you have not stocked up on hurricane supplies, now is the time. Lastly, I want the entire work force to enjoy a safe summer. Its a time of vacations and outings and no doubt it will be hot for a long time. If you plan to enjoy the outdoors, remember to drink plenty of liquids and have plenty of sunscreen on hand. Watch out for our frequent thunderstorms and take appropriate cover when the lightning comes. See you around the center!Its great being in the human launch business again.DR. PERAKATH Benjamin (center) and Dr. Michael Graul (left) of Knowledge Based Systems recently demonstrated the Toolkit for Enabling Adaptic Modeling and Simulation. With them is Glenn Rhodeside, the NASA KSC contracting officer technical representative with the Constellation Project Office.By Linda Herridge Staff Writer W hat do a space garden, a technology to treat contaminated groundwater, and a failure detection system used on space shuttle main engines have in common? They are all cutting-edge technologies that got their start in NASAs Small Business Innovation Research (SBIR) Program or the Small Business Technology Transfer (STTR) Program through contracts with Kennedy Space Center. Some of the innovative technologies in these programs even go on to win awards and recognition in both the public and private sector. Recently, the Emulsified Zero-Valent Iron technology developed at KSC to treat contaminated groundwater received NASAs Government and Commercial Invention of the Year for 2005. Chuck Griffin, who manages both programs for KSC, said the seed funds from the programs are Technologies find commercial use through NASA business program targeted to stimulate innovation to develop technologies in a way that enables commercialization and provides a benefit back to NASA. United Space Alliance is now using a program developed through an SBIR contract with KSC  the Toolkit for Enabling Adaptive Modeling and Simulation (TEAMS)  for space shuttle ground processing to support operations analysis and scheduling. The program, developed by Knowledge Based Systems Inc. (KBSI) in Texas, provides operations modeling and analysis for space transportation systems. According to KBSIs vice president, Dr. Perakath Benjamin, the SBIR program has helped the company build and deploy advanced technology solutions that are benefiting NASA, the U.S. Department of Defense and private industry. Working with NASA has been a rewarding and beneficial experience, Benjamin said. Through an SBIR contract with KSC, the Sentel Corporation in Alexandria, Va., is commercializing NASAs Electronic Portable Information Collection system. The paperless work authorization procedure system has been through several refinements to handle the size and scope of a very large rocket system development. The system was used in an Atlas V launch in the spring of 2003. ASRC Aerospace Corp. provides support for KSCs Technology Transfer Office and the SBIR office. According to Jennifer Van Pelt, an ASRC project administrator, both programs allow NASA to seek the innovations it is looking for and stimulates technology improvements in the private sector. The programs are especially good for the economically disadvantaged businesses, such as minority or woman-owned, Van Pelt said. The SBIR programs technical topics are aligned with Exploration Systems, Space Operations, Science and Aeronautics Research. SPACEPORT NEWS Page 3 June 23, 2006 KSC employees hear tips on living longer lives DR. SANGEETA Pati of the SaJune Medical Center and Spa in Orlando talks about preventative medicine to employees June 16 as part of the Fuel 4 Women series of health presentations.By Linda Herridge Staff Writer A program in the Fuel 4 Women series of health presentations even captured the interest of a few men scattered among the mostly female audience on June 16 to learn more about optimal aging at the Operations and Checkout Building mission briefing room. The series is sponsored by the Health Education and Wellness Program (HEWP), which is part of KSCs Occupational Health Program. Health educator Jessica Crews said every employee is an asset to the space program, so everyones health is important for the best productivity. If employees take advantage of all that our programs, such as HEWP and Fuel 4 Women, have to offer, it can lead to a better quality of life  both at work and at home, Crews said. The guest speaker, Dr. Sangeeta Pati of the SaJune Medical Center and Spa in Orlando, spoke about hormone changes, heart disease and breast cancer, which especially are concerns for women as they age. Pati practiced evidence-based traditional and alternative/natural medicine for 15 years in Washington, D.C. She visited KSC to speak to workers about preventative medicine. According to Pati, women and men experience hormone depletion as they age, but in women this is more commonly noticeable and is known as menopause. Pati said men also experience side effects such as irritability, depression and sleep problems from hormonal imbalances. We have enough information out there now to achieve an optimal health level, Pati said. The goal is to replace hormones, improve nutrition and remove the toxins we take into our bodies. Pati said studies revealed that thyroid gland production begins to decline around the age of 35 in women, resulting in imbalances of the hormones estrogen, progesterone and testosterone. Hormone receptors, which are in every organ of the body, gradually become insulin resistant and then fat is stored instead of muscle being built. External factors, such as exposure to pesticides, fertilizers and artificial hormones in meats and other food products, also may cause imbalances. Melatonin is the bodys major cancer-fighting hormone, according to Pati. Only 4 percent of breast cancers occur in those with the BRCA 1 and 2 genes. The other 96 percent occur due to hormone imbalances and other factors. Only 30 percent of heart attacks occur in those with elevated cholesterol levels. Pati said these conditions may be preventable by bringing the hormones back into balance, replacing what is lost, maintaining proper exercise and diet, and breathing properly. Pati recommends using bioidentical hormones, which are natural compounds available by prescription. The longer we can hang on to our natural hormones, the less risk there is for heart attack, Pati said, adding that bioidentical progesterone inhibits clots and provides better cancer protection. There are also studies that suggest that the use of hormones earlier can help to prevent illnesses such as Alzheimers, Pati said. By Jeff Stuckey Editor P ete Wilson, a Boeing employee who has been employed at Kennedy Space Center for more than 22 years, clearly was proud when his son Jamie received the NASA College Scholarship Fund from Center Director Jim Kennedy during a recent meeting with senior management. Jamie has always amazed me, Wilson said. He was reading when he was two years old. Now Ill be sitting in the wings, waiting to see what he will do from here on out. Jamie is one of six students nationwide who were awarded the 2006 NASA Scholarship Fund out NASA scholarship winner, father grateful for award of 120 applicants. The fund awards scholarships agencywide to qualified dependents of current and former NASA employees planning to major in science or engineering. The program is a result of an unsolicited gift by Pulitzer Prizewinning author James Michener. At the presentation ceremony, Kennedy expressed how impressed he is with the students who want to work at NASA. The caliber of young people coming in behind us is incredible, Kennedy said. This year, NASA will award six $8,000 scholarships to people such as Jamie. This is a highly competitive award. Jamie, who plans to attend the University of Florida, ranked first in a class of 328 students at Astronaut High School in Titusville. It feels really great to receive this scholarship because, even with the other scholarships Ive received, college is so expensive these days, Jamie said. Visit http://www.lerc.nasa.gov/ WWW/OEP/FUND.htm for information.NASA COLLEGE Scholarship Fund recipient Jamie Wilson (third from left) is joined by his father, Pete (left), stepmother, Tami, and Center Director Jim Kennedy at the award presentation. Page 4 SPACEPORT NEWS June 23, 2006 STS-121 crew participates in full dress r eh STS-121 . .(Continued from page 1)on the mobile transporter, and the systems reel assembly. They will also install a spare part for the stations thermal control system for future use. During STS-121, mission managers expect to evaluate the high probability of shuttle consumables supporting an extra day for the mission. In case an extra day is available, the crew and flight control team are training for a third spacewalk. This spacewalk would include tasks to test techniques for inspecting and repairing the reinforced carbon-carbon segments that protect the orbiters nose cone and wing leading edges. Inspections of the orbiters heat shield with a 50-foot-long orbiter boom sensor system are scheduled to take place before Discovery arrives at the station and again near the end of the mission, on the day before and the day of undocking from the space station. Undocking is set for flight day 11. Discoverys crew will make final preparations for the return home on flight day 12, with landing at KSCs Shuttle Landing Facility on flight day 13. For updates, visit http:// www.nasa.gov/shuttle .SOME OF the STS-121 crew members practice getting into a slidewire basket on La basket are Mission Specialists Piers Sellers, Stephanie Wilson and Thomas Reit er. Lindsey, Mission Specialists Lisa Nowak and Michael Fossum, and Pilot Mark Ke lly STS-121 COMMANDER Steven Lindsey (left) and Pilot Mark Kelly take part in emergency egress practice, part of the training activities that include a simulated countdown culminating in main engine cutoff. STS-121 MISSION Specialist Lisa Nowak prepares to leap from the slidewire basket during training on emergency egress procedures from the launch pad. At left is Mission Specialist Michael Fossum. AT THE Shuttle Landing Facility, STS-121 Pilot Mark Kelly gets ready for a training fli Shuttle Training Aircraft (STA). He will be practicing landing the orbiter using the S TA Grumman American Aviation-built Gulf Stream II jet that was modified to simulate an cockpit, motion and visual cues, and handling qualities. Page 5 SPACEPORT NEWS June 23, 2006 eh earsal, management OKs July 1 launch La unch Pad 39B while others watch. In the er. Behind them are Commander Steven lly fli ght in a TA which is a an orbiters SPACE SHUTTLE Program and mission managers meet for the traditional Flight Readiness Review, a thorough assessment of preparations for the mission. Among those seated at the table on the left are Center Director Jim Kennedy, Associate Administrator for Space Operations William Gerstenmaier and Marshall Space Flight Center Director Dave King. Shuttle Program Manager Wayne Hale is seated under the center screen on the back wall. Also attending is NASA Administrator Mike Griffin. The June 16-17 meeting produced a number of key decisions about Discoverys mission, STS-121, including selection of a July 1 official launch date. UNDER THE watchful eye of Capt. George Hoggard (left front), who is the astronaut rescue team leader, STS-121 Commander Steven Lindsey takes his turn driving an M-113, which is an armored personnel carrier. Behind Lindsey and Hoggard are Mission Specialists Piers Sellers (waving) and Michael Fossum. THE SUITED STS-121 crew members stride out of the Operations and Checkout Building on their way to Launch Pad 39B for a simulated countdown. Leading the way are Pilot Mark Kelly (left) and Commander Steven Lindsey. Behind Kelly are Mission Specialists Lisa Nowak, Stephanie Wilson and Thomas Reiter. 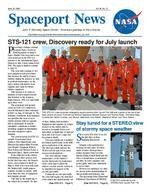 Page 6 SPACEPORT NEWS June 23, 2006 Stelzer helps NASA advance toward New Horizons By Anna Heiney Staff Writer J an. 19, 2006. Its a clear afternoon in central Florida, where an Atlas V rocket puffs chilled mist into the air at Cape Canaveral Air Force Stations Launch Pad 41. In the Atlas Space Operations Center four miles away, NASA Launch Manager Omar Baez polls the launch team to ensure everyone is ready to release the last built-in hold in the countdown. NASA MIM, calls Baez as he moves down the list. NASA Mission Integration Manager Mike Stelzer punches a button on his console. NASA MIM is go, he responds. About five years have passed since Stelzer began the challenging task of heading up the effort to bring the New Horizons spacecraft and the Atlas V vehicle to this point. Now, with the countdown clock approaching T-0, its time for the spacecraft to head for faraway and mysterious Pluto  the only planet in our solar system that hasnt been observed up close. New Horizons became the fastest spacecraft ever launched, racing away from Earth at more than 36,000 miles per hour. The spacecraft will reach its target in July 2015, spending five months conducting the first in-depth study of Pluto and its moons, then continuing on to another Kuiper Belt object. Onboard the piano-sized probe are seven science instruments that will reveal the surface properties, geology, interior makeup and atmospheres of these planetary bodies. Like other missions, New Horizons had several major challenges. The toughest among them was pulling the mission together with a tight timeline for a launch in January 2006, to take advantage of a flyby of Jupiter in 2007 that shaves up to five years off the trip to Pluto. As the NASA MIM for New Horizons, Stelzers job was to ensure a successful launch by coordinating the activities of the mission integration team. Participants included the Johns Hopkins University Applied Physics Laboratory, which built the spacecraft; Lockheed Martin Corp., which supplied the Atlas V launch vehicle; The Boeing Company, which provided the third stage; and the U.S. Department of Energy, which supplied the radioisotope thermoelectric generator (RTG), the spacecrafts long-term power source. Its not easy to define a typical day for Stelzer, one of several mission integration managers working for NASAs Launch Services Program at Kennedy Space Center. In the early stages of mission planning, he had to learn each participants needs and help answer a host of questions: What were the missions goals? When did it have to launch in order to arrive at Pluto? What type of launch vehicle could best handle the mass of everything onboard  and hurl a spacecraft on a path to the most distant planet from our sun? In the beginning, there was no hardware to see, Stelzer explains. It was all conceptual and involved a lot of visualization. As the mission began taking shape, planners methodically resolved development and design issues. Engineers built and tested hardware, and if parts didnt fit or operate as expected, the problems were solved through reviews, redesigns and more testing. Its a lengthy process that takes years, but everyone involved knows these steps are critical to a successful mission. Finally, mission planning moved into the last stage: the launch campaign. The teams excitement grew as the various launch components began to come together at the launch site. I remember going out to the launch pad with Alan Stern, the principal investigator, to see the configuration before closeout, Stelzer recalls. Alan had been pushing the mission to Pluto for decades, and this was a chance for him to take one last peek before we launched his vision. Thanks to the expert knowledge and tireless work of people like Stelzer, New Horizons is now sailing through space on a mission of several firsts. To name a few examples, its the first Atlas V launch of a spacecraft with an RTG, the first flight of an Atlas V with a third stage, and the first mission to an unexplored planet since the launch of Voyager in 1977. Today, New Horizons is headed toward a rendezvous with Pluto and the Kuiper Belt, to teach us more about this unexplored region of our solar system.MIKE STELZER, NASA mission integration manager, learned the requirements of each team member for the New Horizons spacecraft.mission, at press time scheduled to lift off in late July aboard a Boeing Delta II rocket from Launch Complex 17 on the Cape Canaveral Air Force Station, will help provide the big picture by using two nearly identical spacecraft to image the sun and track its activity in high definition 3-D. Particularly crucial will be its observations of coronal mass ejections, the most powerful explosions in the solar system. Related to solar flares (scientists still dont really know which comes first), these ejections can pack the force of a billion megaton nuclear bombs. In terms of space weather forecasting, were where weather forecasters were in the 1950s, said Dr. Michael Kaiser, project scientist for STEREO at NASAs Goddard Space Flight Center. They didnt see hurricanes until the rain clouds were right above them. In our case, we can see STEREO . .(Continued from page 1) storms leaving the sun but we have to make guesses and use models to figure out if and when it will impact Earth. A strong fleet of satellites is observing the sun now, but even with missions like SOHO, which images the sun every 10 to 15 minutes, scientists still cant definitively say if a coronal mass ejection is coming toward Earth or traveling away from it. For that, we need to see the third dimension. This marks the first time that two spacecraft will launch on the same rocket, and then swing around the moon to get into separate orbits. Once there, STEREO A will fly ahead of the Earth and STEREO B will fly behind it. When the solar arrays are deployed, the spacecraft will be about the length of a large school bus. Along with improving space weather forecasting, STEREO is also an important key to understanding the suns influence throughout the solar system. SPACEPORT NEWS June 23, 2006 Page 7 Remembering Our HeritageA ny scientist would dream of using four interactive $500,000 desktop microscopes for free. With the help of Kennedy Space Centers Virtual Lab, students across the nation are the researchers getting a chance to do just that. While we cant place students in front of every microscope at KSC, we can place Virtual Lab at almost every computer in the country, said Theresa Martinez Schroeder, education technology project manager. The NASA Office of Education-funded Virtual Lab emphasizes the importance of making science engaging for students by using materials they can relate to beyond the classroom. By providing virtual access, students can use KSC instruments and high-tech hardware without interfering with center security or operations. The lab is a suite of virtual microscopes with names like something out of Star Trek, including a scanning electron microscope, light microscope, atomic force microscope and an energy dispersive spectrometer. Many have controls such as zoom, focus, magnification and brightness, and annotation tools. Researchers from Macquarie University in Australia recently began studying the beginning of life on Earth by examining a 3.5-billionVirtual Lab offers state-of-the-art microscopes year-old stromatolite using Virtual Lab to share data. Also, researchers from the Field Museum in Chicago are using the lab to study rare specimens of what is believed to be a new species of starfish. These studies of the stromatolites are essential to the search for life on other planets, also estimated to be 3 to 4 billion years old, said Schroeder. A visit to this area of Australia is being turned into a virtual field trip, with the use of the lab. NASAs Ames Research Center in California is developing the virtual field trip and it soon will be available at http:// quest.arc.nasa.gov/vft NASA employees are encouraged to contribute to Virtual Lab by providing NASA-related specimens. Items such as flight weld samples and NASA-developed paint, which changes color to show corrosion, currently are being used. For more information, contact Schroeder at 867-0590 or theresa.m.schroeder@nasa.gov For details and to download Virtual Lab software, visit http:// virtual.itg.uiuc.edu Beginning in December, educators can access more than 70 lesson plans, discussion boards and more at http:// edcollege.ucf.edu/nasa. By Kay Grinter Reference Librarian T hroughout the space program, cameras have functioned as the eyes of earthbound aerospace engineers anxious to learn if the flight hardware they designed would behave as intended. This knowledge was especially crucial to those evaluating the test flights of the man-rated Saturn V vehicle: Apollo 4 in November 1967 and Apollo 6 in April 1968. Camera capsules were first jettisoned and recovered in the Saturn development program on the test flight in January 1964. Divers located seven of eight capsules, although three were damaged on impact with the ocean. The captured images proved the camera capsules were valuable as a hardware analysis tool. The capsules used on the Saturn V test flights had three Then and now: Cameras traveled uphill on test flights compartments: one housing the lens with a quartz viewing window and another containing the camera and its control unit. A third contained assorted recovery paraphernalia: stabilization flaps, a paraballoon to slow descent and aid flotation, a radio and light beacon, sea marker dye and, last but not least, shark repellant. The shark repellant was released along with the marker dye when the capsule hit the water. It was added to the recovery package after an unrecovered capsule washed up on shore with marks on the casing thought to have been made by a shark attempting to swallow it. NASA Alumnus John McBrearty, now living in Fernandina Beach, Fla., was a NASA systems engineer on the team responsible for processing S-II camera capsules on Apollo 4 and 6. He recalls: Lloyd Stephens of North American and I devised a comprehensive testing plan for the capsules, based on the experience gained from the Saturn I test flights. One power unit failed our battery charge capacity test two months prior to launch. When another unit failed during prelaunch tests, we took both units to the failure analysis lab where the Ni-Cad Batteries were found to be leaking electrolyte he explains. Our only chance to support the launch was to remove the batteries, clean the printed circuit boards, and then install new batteries and repot them. Fortunately, all this was done in time to install the capsules on the Saturn V at T-2 hours. By launch time, we had worked 36 hours without a break. The cameras jumped into action 36 miles above the Earth with the rocket traveling 6,000 miles per hour. As explosive charges severed the connections between the first two stages and the interstage structure dropped away, the 16 mm camera lens recorded the results on Ektachrome color film at 100 pictures per second. The camera capsules were flown to NASAs Marshall Space Flight Center in Alabama for processing.Images of spectacular stage separation on Saturn V rocket was worth the waitTHE SATURN V rocket for Apollo 4 (pictured) and Apollo 6 used camera capsules to analyze stage separations. Above, the camera captured these images 36 miles above Earth.